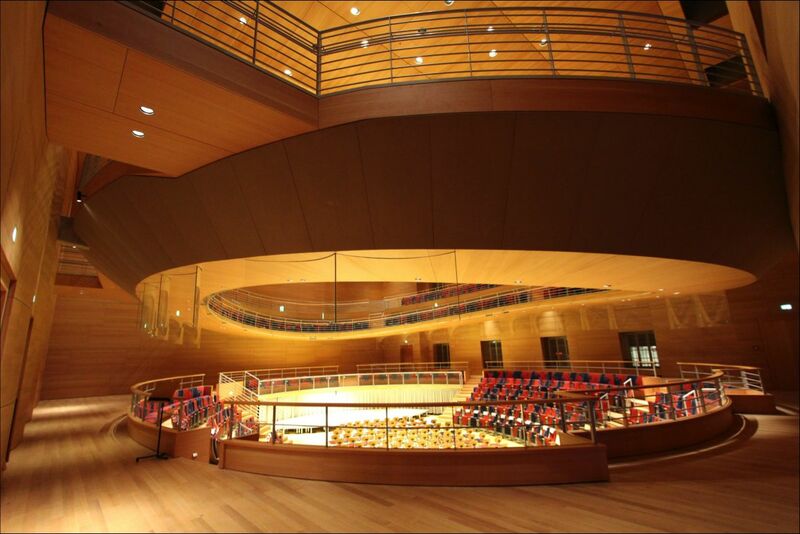 Barenboim Said Academy’s special architectural gem is the concert hall designed by Frank Gehry “pro bono” and named after the French composer and conductor Pierre Boulez who died in 2016. The oval design is characterised by two ellipses the axes of which are offset against each other so as to create the impression that the tiers are floating weightlessly in space. The Japanese sound artist Yasuhisa Toyota is responsible for the acoustics of the hall. 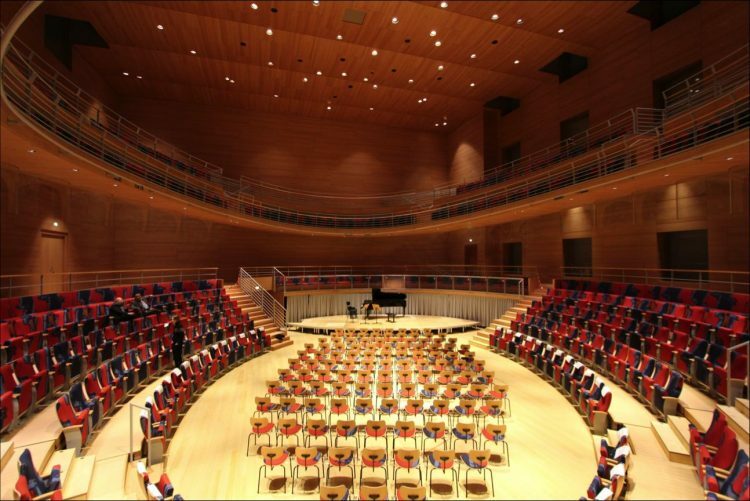 The Pierre Boulez Saal is used both as a location for students and as a commercial-purpose concert hall with its own program of musical events, and accommodates an audience of 680. It is an ideal venue for soloists, chamber music, and small orchestras. The Pierre Boulez Saal public call for tenders included the media equipment, i.e. the voice alarm components and the speakers for reinforcing the sound in the concert hall, as well as the stage and hall lighting. Having responded to the voice alarm specification prepared by the specialist planner Florian Schaller with a proposal that combined state-of-the-art voice alarm and stage management equipment in an innovative approach, Amptown System Company Berlin was awarded the job. ASC Berlin cooperated with PAV GmbH in installing a fully digital DSM40 voice alarm system certified to DIN VDE 0833-4 which is interconnected with a fire alarm system certified according to ISO DIN 14675. The latter ensures that if there is an emergency, visitors can leave the building in an organised fashion via escape routes which were previously defined. Apart from its principal application it also allows for generating public addresses and background music and offers a great variety of options concerning volume, EQ, delay etc. The intercom system was customised and can be operated via an ADUNAS media control system just like a stage management system can. The classical separation between hall and stage light does not exist here unambiguously, but flows smoothly into each other. Therefore, all lights and headlights can be controlled individually. Both stage lighting and hall lighting were supposed to allow for dimming as an infinite process from switching on the power to a 100% darkening without a jolt at the start. So the architectural and the scenic lights were selected accordingly. All of the lights and spots can be controlled individually and used either as a hall or a stage light. Control does not treat these applications separately, it may vary between the two any time. The cable ducts are discreetly concealed behind the wood paneling and installed so as to ensure EMC (electromagnetic compatibility) and avoid any interference with the A/V media equipment. Wherever possible the LED ballasts and the electronic light control equipment were transferred from the concert hall to the central multimedia rack and dimmer room to minimise any such effects. ASC had involved the English manufacturer Global Design Solution, an expert for customised light and control solutions, to ensure that the high standard set by Gehry with respect to the sophisticated lighting equipment was met. Working closely together ASC, Florian Schaller and GDS succeeded in developing a tailor-made lighting arrangement which is unique worldwide. ASC integrated numerous special structures which had been designed as requested by the architects into the overall system. These lights are integrated both in the tier area and in the acoustic ceiling. 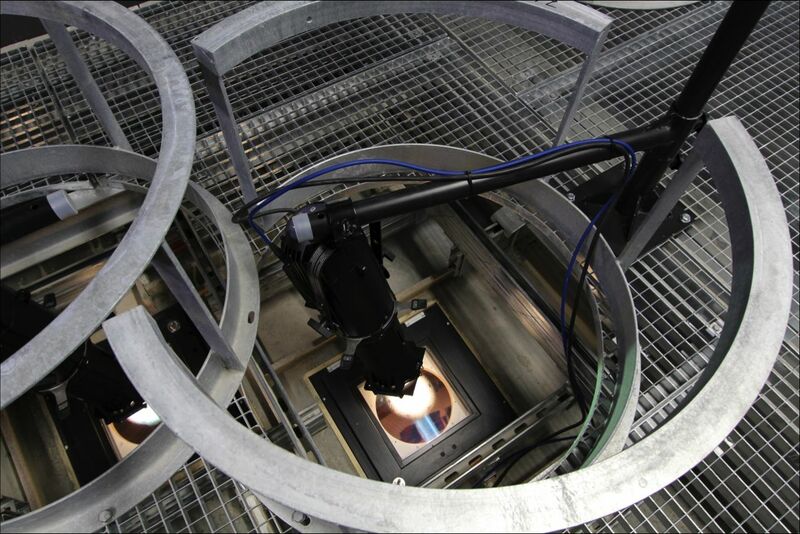 The lights in the acoustic ceiling are conveniently accessible via the grating of the technical equipment level and easy to reach in an accessible duct (catwalk) and manipulate for maintenance purposes. 79 LED profile spotlights from the ETC Source Four product family (Tungsten, series 1) are used to light the ceiling above the ellipsoidal tier area. Light in the required brightness of 1,000 lux minimum from the same spotlights will cover the stage area as well. Along with the acoustic ceiling transparent glass inserts in the spotlight openings form a continuous reflection surface which ensures perfect sound. The Source Four LED spotlights can shed light at angles between 25° and 50° from within the ceiling and provide warm white light for scenic lighting. They typically produce clearly delimited fields of light and stand out for high versatility and extended service life.These spotlights will light up the protagonists on the stage directly without producing shadows. The spotlight cables run to the central rack room while those of the safety lighting don’t. Likewise GDS lights are integrated in the outer circle above the stage, below the tiers, in the corridors, at the doors, and at the steps. The creative GDS product range features a great diversity of luminaires and special structures with specifically developed lamps. Both the hall (or architectural) and the safety luminaires use LED lamps and are manufactured to meet the highest and most advanced standards. Like the scenic lighting they are managed via the ADUNAS media control system. An essential criterion in the planning and tendering phase was to ensure the freedom from interference of the microphones, among other things, by the acoustic influences of the electronics (whistling, humming, whirring) and the cable routes through inductions (EMC influences). There were three solutions: Outsourcing of LED ballasts and lights in the dimmer room outside the concert hall, as far as possible. Separate routing of AV technology to other trades with the widest possible distances. Cable routing of all cables in covered metal cable trays or in Stapa tube. The cables in the hall did not have to be visibly integrated so that the design aesthetic was not touched. On the part of the lighting designers, there was a high demand on the dimming quality, which is why GDS came into the business. Nonetheless, the architects did not want to see a lot of lights. In the technical ceiling above the hall, the floodlights can be flexibly used as a hall or stage lighting. This is an extremely innovative approach. The Voice Alarm System (SAA) is a combination of voice alarm and stage management system certified to ISO DIN 14675. It is very rare to install a combination of this type, which is also DIN VDE 0833-4 certified and thus one of the most modern system on the market. Only a few system integrators can integrate this and ASC is one of them. From the perspective of ASC, the cooperation with GDS and the specialist planner Florian Schaller was amazing. The development of the LED recessed or surface-mounted luminaires as special luminaires was extremely innovative, as was the combination of voice alarm and stage technology according to the idea of the planner, from which a very good system solution was born. With a size of 850 square meters and a telescoping grandstand, the Pierre Boulez Saal offers a versatile modular space for concert and event operation where different configurations can be arranged with the mobile rows of seats. It is an ideal venue for soloists, chamber music and small orchestras. Pierre Boulez Saal is used extensively and, if things go the way Daniel Barenboim, the creative and driving force behind this project, wants them to, is on its way to becoming one of the best chamber music halls in the world. Versatility, open-mindedness, and musical curiosity – what characterised the spirit of the composer and conductor after which the Hall was named is also reflected in the guiding principles which determine the programme of each season and continue to do so in 2017/18. In it contemporary music and the great works of chamber music of the classical and the romantic genre and the major works of the twentieth century are presented in equal proportions.